What manufacturing process do you use in your factory? First, we bring all the liquid elements of our formulation to a boil. Afterwards, we mix it with the solid ingredients. This blend is then sent to our production line where the bars are shaped, cut and packaged. This manufacturing process preserves the natural qualities of the ingredients and the nutritional values of our bars. What kind of bars can you manufacture? What is your maximum production capacity? Our maximum production capacity is 3 million bars per week. Our minimum quantity per order depends on the kind of bars you want. In general, the minimum quantity for an order is 100,000 bars but the quantity can be reduced in some cases. The production can be divided into 2 or 3 flavors if needed. What is the average shelf life of the bars? On average, the shelf life of the bars manufactured by Yourbarfactory is 12 months. But the shelf life can vary according to the ingredients used in the formulation. How long will it take to launch my private label bar on the market? If your bar is similar to one of our existing formulation, you can launch your product on the market in about 4 months. If you want to create a new recipe for your bar, the design time will be a bit longer and it will take approx. 9 months to product launch. What kind of packaging can you propose us? The wraps and the packaging will be stored in our own warehouse. How can you certify that your products don’t contain any peanuts? Our factory is peanut-free and nut-free certified. 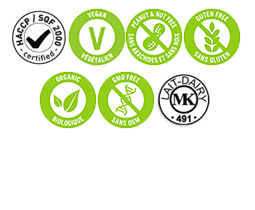 All the ingredients we buy are certified peanut-free and nut-free by all our suppliers. Moreover, these allergens are strictly forbidden throughout the entire plant. We also regularly submit to a third-party audit in order to keep our nut-free and peanut-free status. What kind of claims can I have for my bar? Depending on the ingredients used, you can have the following claims: gluten-free, GMO-free, Kosher, dairy-free, organic… The peanut and nut-free guarantees apply to all the bars we manufacture at our factory. What quality certification have you got? Yourbarfactory, manufacturer of bars for private label and co-packing, is SQF-level2 certified. This is one of the most reputed and demanding quality control program in North America. Our factory is also nut-free and peanut-free certified. We also respect the Good Manufacturing Practices (GMP). Is your factory kosher certified? Yes, our factory is Kosher MK certified (Montreal Kosher). This means that all the ingredients that enters our factory must be themselves kosher and approved by the Montreal Kosher council. We don’t use any ingredients of animal origin. We use vegetable glycerin. Can you create a bar from a specific ingredient that I already market? Yes, we can use this ingredient provided that it does not contain nuts and peanuts. Our R&D department will create the bar according to your specifications. How does the delivery of the manufactured bars work? The delivery of your bars can take place in your warehouse. We can also establish a price for a delivery at our door (EXW), if you prefer. We can deliver your product worldwide.